"Flight Stats" is a Global Flight Tracker and Travel Planning Extension. What is new in this version? Check this link for information about your recent update. How to add/remove the toolbar button in Firefox? To add/remove the toolbar icon right-click on a free space in your Firefox toolbar and select "Customize...". Now you can drag and drop the button to a new position. How to access to Flight Stats settings? How to enable Panel View in Google Chrome? To Enable Panel View Type "chrome://flags" in the addressbar then Press Enter in the Flag's page Search for 'Panels' and Click on 'Enable' then Restart Chrome. You should see Panel view if you click on Flight Stats icon. 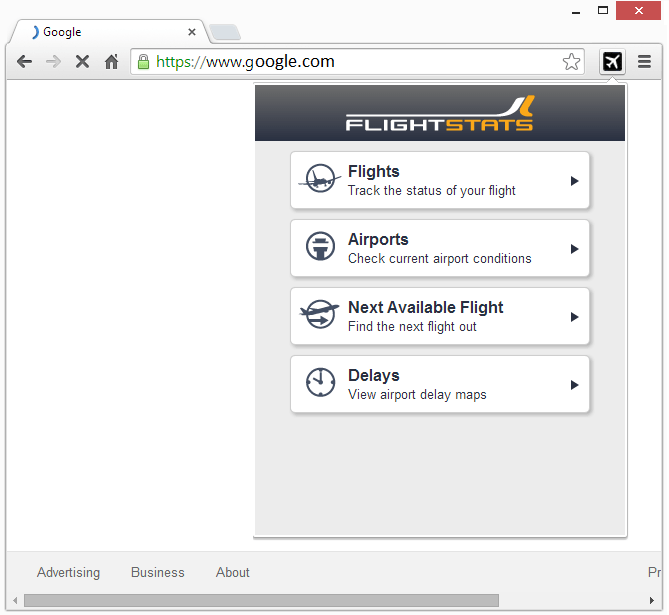 How to install Flight Stats in your Firefox? To install Flight Stats, head to Mozilla Store and click on "Add to Firefox" button. How to uninstall Flight Stats from your Firefox? To uninstall Flight Stats go to Firefox -> Add-ons -> Extension Name, then press Uninstall button. Please keep reviews clean, avoid the use of improper language and do not post any personal information. If you have questions about the extension, or ideas on how to improve it, please use the "Contact Developer" link above. Don't forget to search through the bug reports first as most likely your question/bug report has already been reported or there is a workaround posted for it.